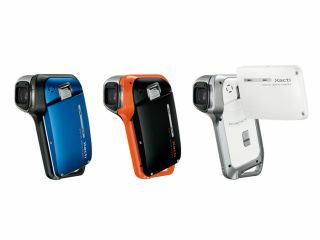 Take a standard, low-end consumer video camera, slap a few new colours on the case and give it the ability to work underwater and what've you got? Well, unless you're heavily into gimmicks, you have a pretty disappointing new Xacti from Sanyo. The 258g Xacti DMX-CA8 goes on sale worldwide at the end of May for, based on the Japanese price (the only one announced so far) of ¥50,000, around £250. Unfortunately for anyone excited about filming water sports on SD cards, it's yet another disappointing camera. An 8.1-megapixel CMOS for stills is fine, as is the ability to shoot video at 60 frames per second. Sadly, that video clocks a maximum resolution of just 640 x 480 pixels, which is no great shakes at all. Perhaps most disappointing is the underwater performance - we know this isn't intended for the Marianas Trench, but a depth limit of just 1.5m is next to no use for most people. Still, if the IPX8-level waterproofing is enough for your needs, then the Xacti range is at least easy to use, so should please the kids on a day at the beach.